Established in 1957, The Recording Academy is an organization of musicians, producers, engineers and recording professionals that is dedicated to improving the cultural condition and quality of life for music and its makers. Internationally known for the GRAMMY Awards – the preeminent peer-recognized award for musical excellence and the most credible brand in music – The Recording Academy is responsible for groundbreaking professional development, cultural enrichment, advocacy, education and human services programs. The Academy continues to focus on its mission of recognizing musical excellence, advocating for the well-being of music makers and ensuring music remains an indelible part of our culture. 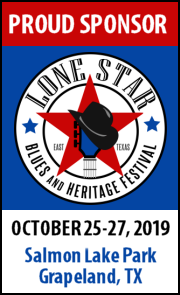 Nola Blue, Inc. operates Nola Blue Records and produces the Lone Star Blues & Heritage Festival. Especially interested in the preservation and sharing of blues history, the company has also published Survivor-The Benny Turner Story. The Blues Foundation, Memphis-based, is dedicated to preserving blues music history, celebrating recording and performance excellence, supporting blues education and ensuring the future of this uniquely American art form. Founded in 1980, The Blues Foundation has 3500 individual members and 185 affiliated local blues societies representing another 50,000 fans and professionals around the world. Its signature honors and events–the Blues Music Awards, Blues Hall of Fame, International Blues Challenge and Keeping the Blues Alive Awards–make it the international center of blues music. Its HART Fund provides the blues community with medical assistance while its Sound Healthcare program offers musicians health insurance access. Blues in the Schools programs and Generation Blues scholarships expose new generations to blues music. The Americana Music Association is a professional trade organization whose mission is to provide a forum for the advocacy of Americana music and to promote public awareness of the genre to support the creative and economic viability of professionals in this field. Dedicated to building and promoting the Americana genre and the individuals who participate in that industry, the Americana Music Association works closely with artists, labels, radio stations, retailers, print media, festivals, agents, publishers and more to help organize and build the infrastructure necessary for the Americana genre to achieve success both creatively and financially. VividPix & Design offers a variety of creative services. Graphic design for print and the web. Performance, portrait, nature and event photography. Copyright © 2019 Blind Raccoon. Powered by WordPress and Stargazer.